Back in 2003, the Atlanta Braves traded Adam Wainwright along with pitchers Jason Marquis and Ray King to the St. Louis Cardinals for JD Drew and Eli Marrero. At the time of the trade, Wainwright was a 21 year old prospect who just finished up his season in AA. The Braves were getting Drew, a power hitting outfielder, who in the previous 4 seasons only played 104, 135, 109 and 135 games, thanks to injury problems. Drew would take over for Gary Sheffield, who went on to sign with the New York Yankees. In 2004, during his only season with the Braves, Drew would put up the best season of his career. He managed to stay healthy and played in 145 games. Drew hit .305 with 31 home runs, 93 RBI and walked 118 times. He would finish 6th in MVP voting. The Braves went on to the playoffs but lost to the Houston Astros in 5 games in the NLDS. In that series, Carlos Beltran hit .455 (10-22) with 2 doubles, 4 home runs, 9 RBI and scored 9 runs for the 'Stros. Remember, that was only a 5 games series. After the 2004 season Drew would sign a 5-year $55 million deal with the Los Angeles Dodgers. After playing in just 72 games in his first season with the Dodgers, Drew played in 146 games, hit 20 home runs and drove in 100 runs. After his second season with the Dodgers, Drew opted out and became a free agent again. He would sign another 5-year contract with the Boston Red Sox for $70 million. Out of a possible 810 games, Drew played in just 606 games over the 5 years in Boston. After a injury plagued career, JD Drew retired from the MLB after the 2011 season. Being from Georgia, it was disappointing for Wainwright that he never got to pitch for the Braves, despite being drafted in the 1st round by the team he had dreamed of pitching for. At the age of 23 Adam Wainwright would make his MLB debut with the Cardinals, pitching a total of 2 innings in the 2005 season. After being a starter throughout his entire minor league career, Wainwright made the Cardinals opening day roster for the 2006 season as a relief pitcher. Although they did not acquire Wainwright for his bat, he did homer in his first career at-bat. Wainwright was used mostly in the late innings and did fairly well. 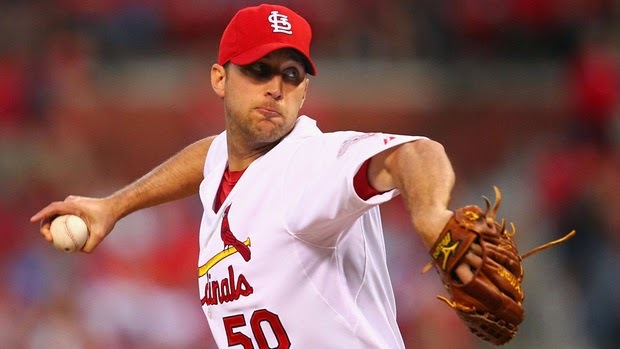 After closer Jason Isringhausen suffered a season ending injury, the Cardinals turned to Wainwright to take over the closer duties. A lot of people might not remember Wainwright as a closer but Mets fans will never forget. In game 5 of the World Series against the Detroit Tigers, Wainwright struck out Brandon Inge to end the game, crowning the Cardinals as World Champions. Despite the great success in the bullpen during the Cardinals World Series run, Wainwright would move to the rotation in 2007. After Chris Carpenter was ruled out for the year due to elbow surgery, Wainwright would be the ace of the Cardinals staff. He finished 14-12 with a 3.70 ERA during his first full season as a starter. Before the start of the 2008 season, Wainwright would sign a 4-year deal, worth $21 million with St. Louis. Wainwright missed nearly 3 months of the season due to a finger injury, but he still finished 11-3 with a 3.20 ERA. 2009 would be Wainwright's break out season. The righty went 19-8, leading all National League pitchers in wins. He also threw 233 innings, struck out 212 batters and posted a 2.63 ERA and finished 3rd in Cy Young voting, just behind Tim Lincecum and teammate Chris Carpenter. Wainwright had the most 1st place votes for the award but somehow still finished 3rd. However he did walk away with a Gold Glove that season. The following season Wainwright would top his 19 win season with 20 Ws. He posted a 2.42 ERA and struck out 213 batters. Wainwright would pitch in his first All-Star game and finished behind Roy Halladay in Cy Young voting. Adam Wainwright had some elbow discomfort throwing batting practice in late February and just 3 days later, the Cardinals would announce that Wainwright would miss the entire 2011 season. Wainwright underwent Tommy John surgery. Even though he missed the season, St. Louis would go on to win their second World Series in just six seasons. He would recover in time for the following spring training but his 2012 was a little rocky. Wainwright finished 14-13 that year with a 3.94 ERA. Bouncing back in 2013, Wainwright went on to win 19 games for the third time in his career and posted a 2.94 ERA. For the second time in his career, Wainwright would finish 2nd in Cy Young voting, this time behind Clayton Kershaw of the Los Angeles Dodgers. Wainwright led the Cardinals back to the World Series, but they would lose to the Boston Red Sox in 6 games. It's pretty clear that the St. Louis Cardinals won this trade as JD Drew would play just one season in Atlanta and Adam Wainwright turned out to be one of the best pitchers in all of baseball.